My first year with YEP was spend working as programme officer for the Climate Change Programme of HoA-REC&N in Gambella, Ethiopia. 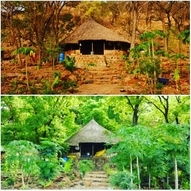 I worked on natural resource conservation by promoting integrated landscape management around Gambella National park and using a 400 ha demonstration site, known as the EcoHub, which was used as a learning location for sustainable agriculture practices (permaculture) and ecologically viable NTFP value chain development. For my second year I changed positions and moved to Zambia where I worked for the World Wide Fund for Nature (WWF). I was based in Sesheke, the Western Province of Zambia, and worked on wildlife conservation in and around Sioma Ngwezi National Park. Futhermore, I was involved with the strategic development for a nation wide Species & Protected Areas Programme. Please click here for more information about my project. During and in between my studies I have gained experience in conducting field research in several countries and habitats. During my Btech Nature Conservatio) I have executed various projects in South Africa focused on natural resource management and wildlife conservation. Within my Masters I executed a tropical ecology course in Uganda, the research for my masterthesis in the Pantanal wetlands of Brazil on tree regeneration for the hyacinth macaw, and an internship in Guinea-Bissau on chimpanzee ecology. After graduation in 2014 I started working at the graduate school Production Ecology & Resource Conservation of Wageningen University as PhD programme assistant. Next to my job at the University I worked as junior advisor with Partners for Innovation (1 day per week) in strategic and business planning for Agroforestry Enterprise Development in West-Africa. Currently I work as Young Expert for MetaMeta / Horn of Africa Regional Environment Centre & Network in Gambella, Ethiopia. Furthermore, I am involved as a volunteer for the Kronendak Foundation and for Future for Nature Foundation, both having a focus on international nature conservation.